“I’m here for the amazing food and wine!” says Brazilian sommelier Diogo Fonseca. We hit it off after meeting on the CMS course in Buenos Aires in March 2015, sharing milanesa, cocktails and his insight into Brazil’s industry. Currently studying for WSET’s diploma (level 4), Diogo is wine manager at Brazil’s first Fleming’s Prime Steakhouse & Wine Bar in Sao Paulo. 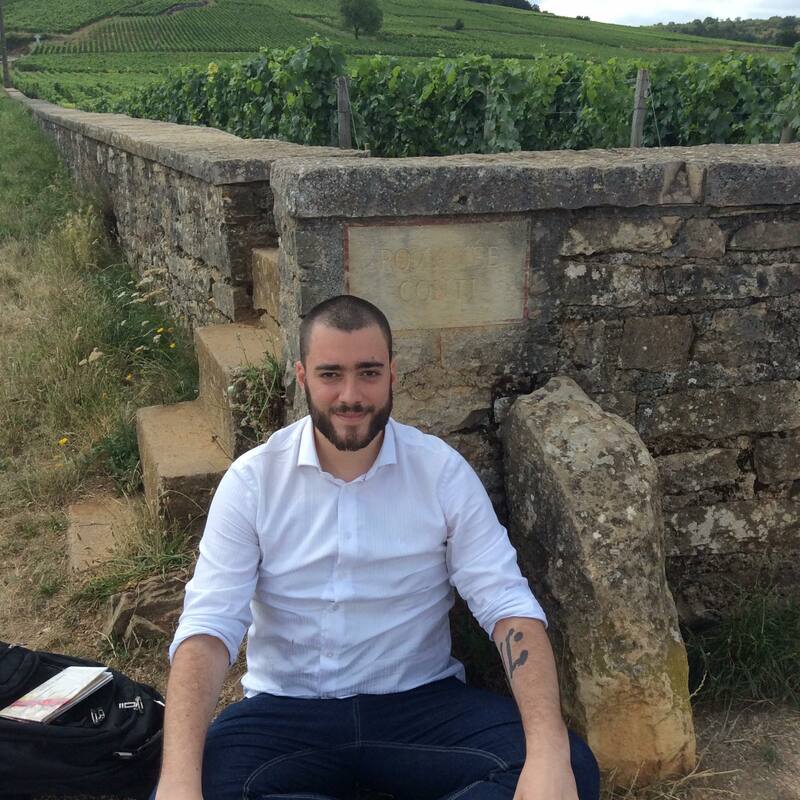 Sommelier Diogo Fonseca at Romanée Conti. A few lemon wedges and some salt on your steak with a flight of wines a guest was drinking. It brings up the fruit of the wines in a very under seen way. It is a very neat little trick, try it! At work: Gary Farrell Pinot Noir 2012 from Russian River Valley. Delicious, fresh and complex pinot. At home: Sipsmith + Fever Tree G&T. What’s your favourite wine region? It has to be Burgundy, since Burgundy got me into wines in the first place (and are still my favourites). But the wine region I would love to be in right now? Hands down Greece, coming up with unique and world-class wines (as are some Assyrtikos and Xinomavros) that are still vastly under-looked. I’m really just here for all the amazing food and wine! But a close second place is the chance to giving guests and employees the confidence they sometimes need to really drink what they love and love what they drink. What’s in your personal cellar? Some ’98 and ’99 red and white burgundies from my recent trip to Beaune. What’s the best thing that’s ever happened to you as a somm? Getting to know a vibrant and amazing wine community in South America when doing my level 2 CMS in Buenos Aires. Brazil is like the poor cousin of the USA, often so alienated of the richness of the world that surrounds our big countries. UK and US supermarkets and the new wave of NYC hipster sommeliers are the contemporary face of wine globalisation. Why go for under-priced outstanding South America whites and reds when you can sell 3-4x marked-up Riesling and Grüner Veltliner? I like to think myself as a Pommard. Assertive, but with a delicate nature.